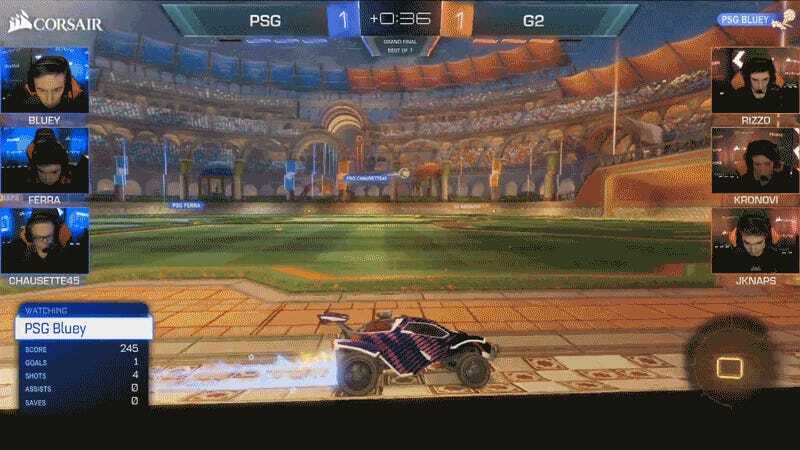 Today’s grand finals between G2 and Paris Saint-Germain managed to go the full distance. It was the champs against the fresh-but-fierce PSG squad, and it all came down to a single goal in extra time. The DreamHack Open finals, held in Leipzig, were a back-and-forth affair, but momentum seemed in G2's favor after two straight wins in games 4 and 5. PSG needed a hero in the sixth game, both to stay alive and cool a surging G2 team. They found that hero in Thibault “Chausette45" Grzesiak, who in a 7-1 slaughter scored a hat trick in just under a minute. But where game 6 was a score-fest, the final match between these two was more cool and collected. The two teams vied for control of the midfield, taking shots and making heroic saves, until a G2 goal set it to 1-0 with less than a minute left. PSG had only a small amount of time to once again save their tournament chances, and this time, they found their savior in Dan “Bluey” Bluett. Going into overtime, it was sudden death. The next goal won. And rounding out the day in heroics, PSG’s third man Victor “Ferra” Francal came flying in for the game—and tournament—finisher. Truly a team effort. PSG eSports takes home $20,000, and almost just as important, their first major win under the football club’s banner.